Televisionista: Friday Night Lights #112: "What To Do While You're Waiting"
Friday Night Lights #112: "What To Do While You're Waiting"
The continuation from last week's cliffhanger takes a surprising turn; Tyra finally becomes a truly likable character and the viewers ponder whether The Streets are as wrong as the entire town of Dillan seems to agree. When we left things off last week, Matt's father was about to return to Iraq and send his son off to Oklahoma. Everyone had, of course, known the writers would find a way to keep Zach Gildford's beloved character in town, but we could hardly expect it would happen so soon. The storyline takes an early U-turn, as Matt's father decides to stay in Dillon, look for a job and take care of his son and mother. But wearing Buddy Garrity's American-flag pin to sell cars does not make the veteran happy, so he returns to Iraq and things go back to what they used to be as Matt comes to terms with the idea that he "wanted him to want to be here, not just be here". Tyra finally comes through as a very strong supporting character whose mom (whom she adores) is humiliated and struck by an abusive boyfriend. Livid, Tyra attacks the creepy assailant with a poker and demands that her mom come to her senses. Although initially I could not see any redeeming qualities in her, Tyra's mom did ultimately appear capable of sound judgment realizing she could never choose a man over her own daughter. Fortunately, the drama also steered clear of cliche of making Tyra a hypocrite as she gracefully rejected a penitent Tim Riggins. Finally, The Streets unleashed their lawsuit against Coach Taylor desperate to find a way to control skyrocketing costs as they struggle to take care of their invalid son with uncertain future. 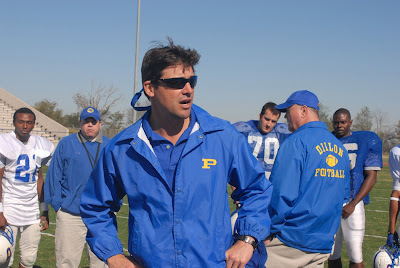 In probably the most powerful scene of the episode, Coach Taylor confronts Mitch Taylor believing "they can't make this personal". Although it may be obvious that the Streets have gone too far, the drama refuses to give the viewer an easy answer, and one might wonder if they wouldn't do exactly the same had they needed someone to blame. "Friday Night Lights" Spoilers: Smash Busted! VIDEO: Patrick Dempsey on "Ellen"
Katherine McPhee To Guest Star On "Ugly Betty"
VIDEO: Grey's Anatomy Returns This Week!